U.S. 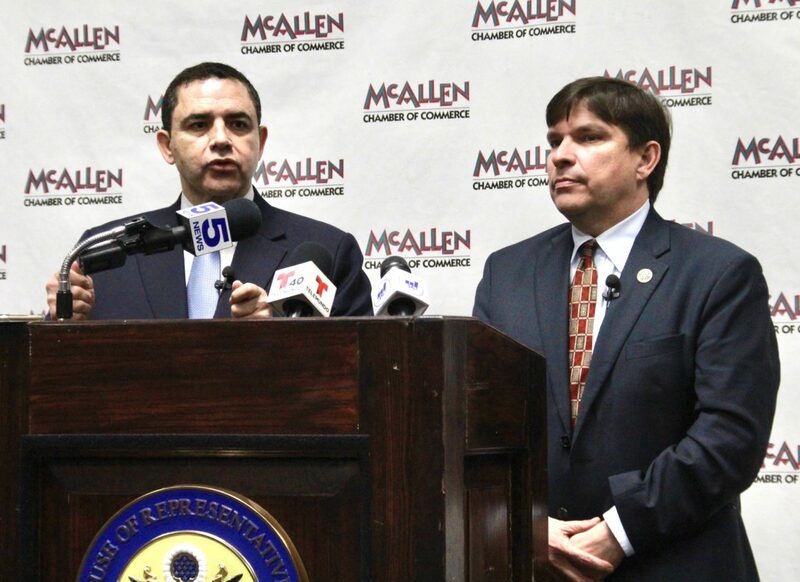 Congressman Henry Cuellar, D-Laredo, and Vicente Gonzalez, D-McAllen, held a news conference Monday afternoon to discuss potential border wall litigation, immigration and U.S.-Mexico trade. Cuellar announced last week that he added verbiage to the fiscal year 2019 Democratic border security proposal that would spare sites such as the Bentsen-Rio Grande Valley State Park, the National Butterfly Center and La Lomita Chapel from border wall construction. Funding for a border wall in those sites was allocated in March through the omnibus spending bill. We’re live at the McAllen Chamber of Commerce with U.S. Congressmen Henry Cuellar, D-Laredo, and Vicente Gonzalez, D-McAllen, who will take questions from the media on legislative priorities, border security, trade and immigration. “I cannot guarantee, but I am hoping that we’re successful in stopping it,” Cuellar said. Gonzalez said restraining orders and other litigation is likely to come this month. Construction equipment for the border wall has already been sent to the Rio Grande Valley, specifically in the areas the congressmen pledged to protect. The president has threatened to declare a national emergency to address the influx of asylum seekers. Both congressmen disagreed with the president’s characterization of a border “crisis,” with Cuellar going as far as saying the president doesn’t truly believe that statement either. However, all of those ideas are contingent on the president’s approval prior to the Feb. 15 deadline to file a government spending bill. If they fail to compromise, another government shutdown could be looming.